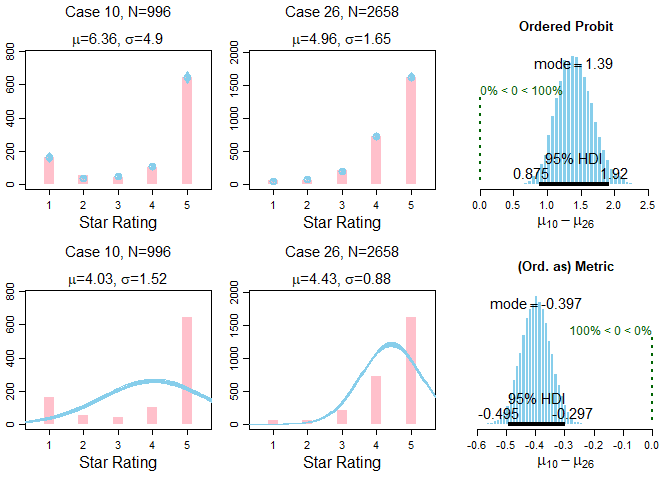 In a previous post I applied a Bayesian ordered-probit model to movie ratings and showed how the results differ from treating the data as if they were metric. The metric model used frequentist t tests (because that's what most applied researchers would do). 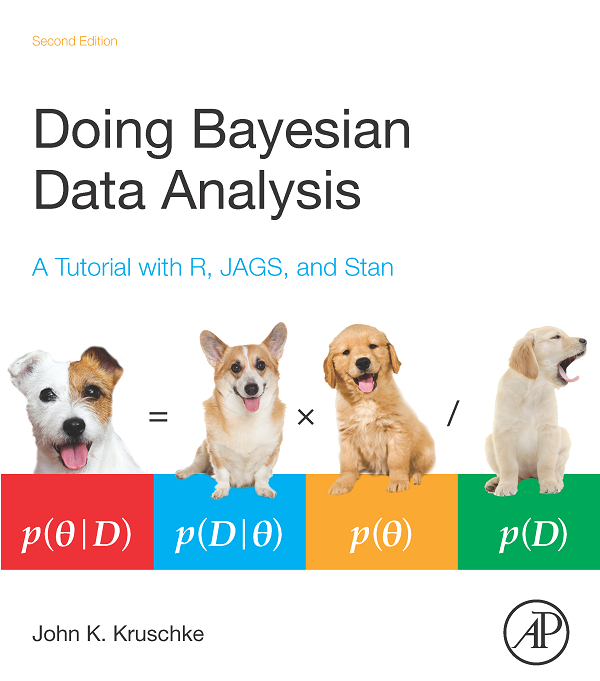 In this post, I re-analyze that data as if they metric but using a Bayesian model that has the same hierarchical structure as the Bayesian hierarchical ordered-probit model I used before. Here we can compare ordered-probit to metric treatments with all else held constant. Spoiler: Same conclusions, of course. 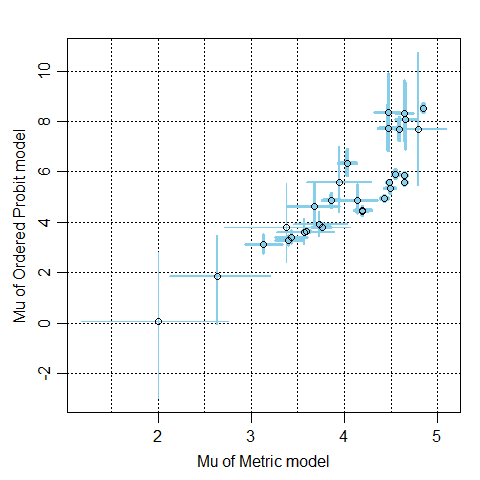 The ordered-probit model fits the data much better than the metric model. Don't treat ordinal data as metric. Please see the previous post for details about the data and the models. In particular, note that there is hierarchical structure on the standard deviations across movies, but not on the means across movies. In other words, there is no direct shrinkage on the means. 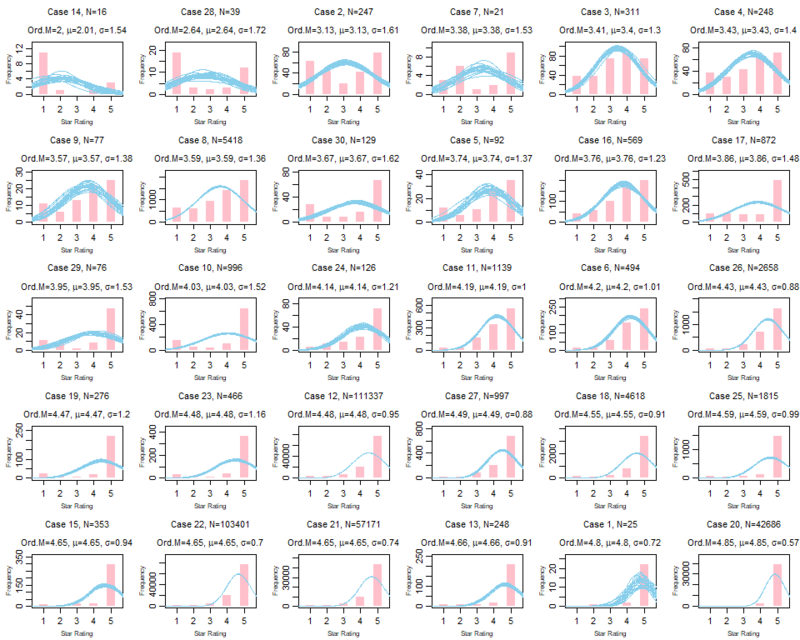 The pink bars (above) are frequency histograms of the data from each movie; the blue dots (with vertical blue whiskers) are the posterior predictions and 95% HDIs for the ordered-probit model. A very good fit, all in all. 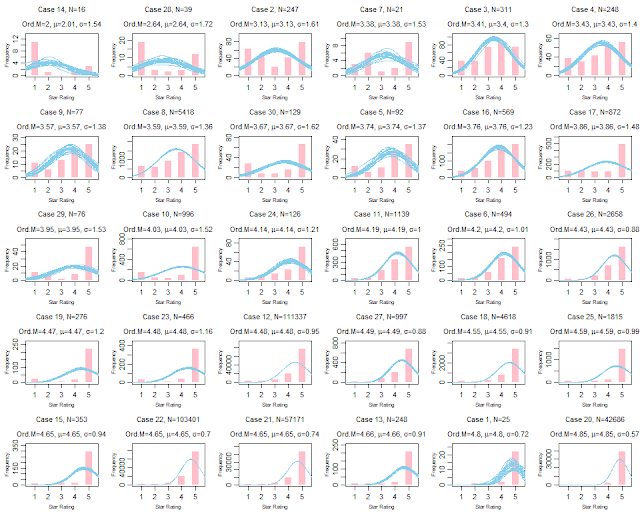 The superimposed blue curves (above) are a smattering from the posterior distribution. 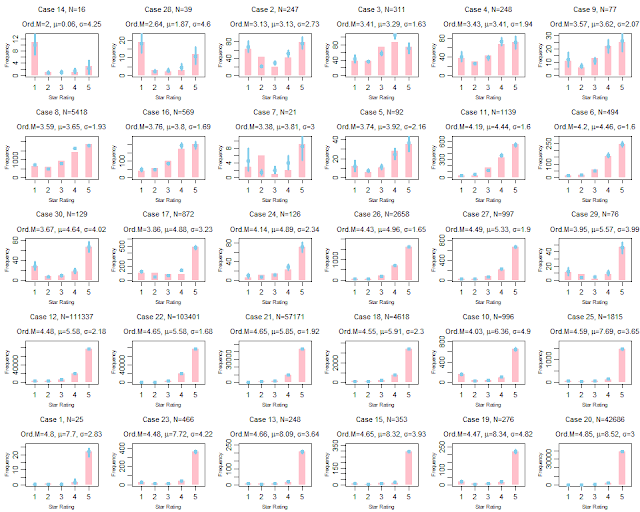 Not a very good fit to the data distributions. You can see (above) that the rank ordering of the movies is quite different for the two models! 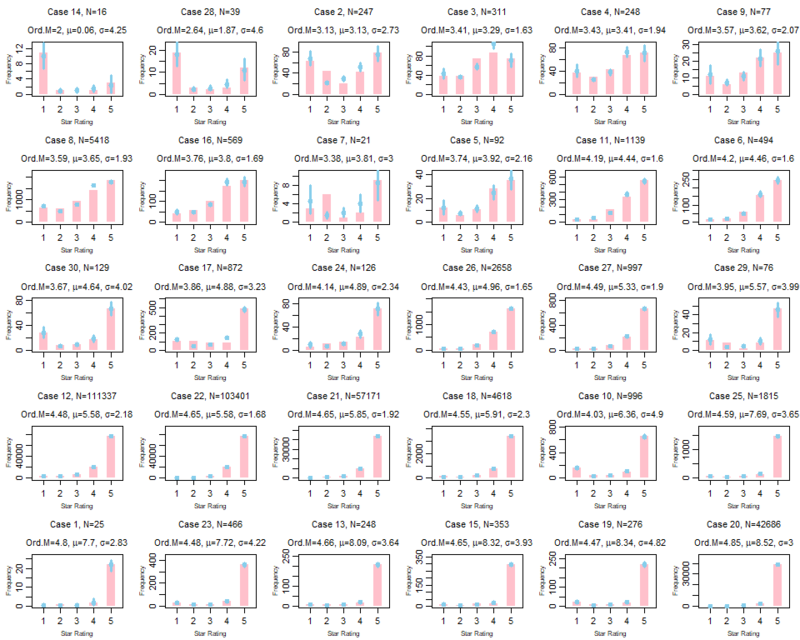 You can see (above) that the ordered-probit puts movie 10 well above movie 26, but treating the data as metric yields the opposite conclusion. Which conclusion is more appropriate? Clearly the ordered-probit describes the data much more accurately than treating the data as metric. Watch movie 10 before movie 26. And don't be a free rider on the rating system. If you use the rating system, give a rating. 2018 April 26 - 28. Stats Camp, Brisbane, Australia. Taught by Prof. Michael Kalish. 2018 June 11 - 15. Stats Camp, Albuquerque, New Mexico. Taught by Prof. Michael Kalish. 2018 June 18 - 22. Global School for Empirical Research Methods, St. Gallen, Switzerland. Taught by Prof. Michael Kalish.